The rap battle you never wanted to see is pretty amazing! 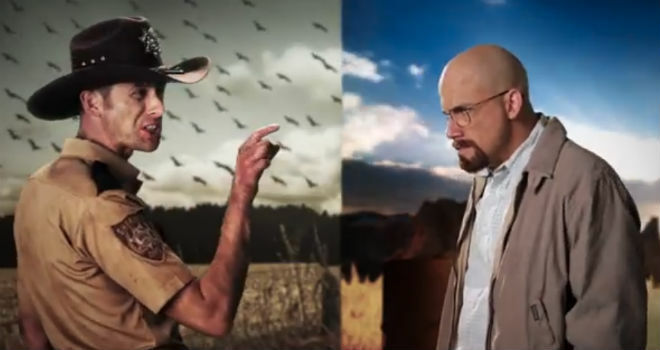 I don’t know how I missed this one: check out the epic rap battle between The Walking Dead’s Rick Grimes and Breaking Bad’s Walter White. Extremely well done, I couldn’t help but laugh!!! Created by Peter Shukoff (aka Nice Peter) and Lloyd Ahlquist (aka EpicLLOYD), ERB features comedic altercations between historical and pop culture figures in a rap music format. Previous New Guardians of the Galaxy Trailer is Here!!! I hadn’t realised that ERB were back, never mind tackling such cool subjects. Thanks for the heads up!